A delicious cookbook from Tom Kerridge featuring his favourite everyday recipes Tom Kerridge is known for beautifully crafted food and big, bold flavours. 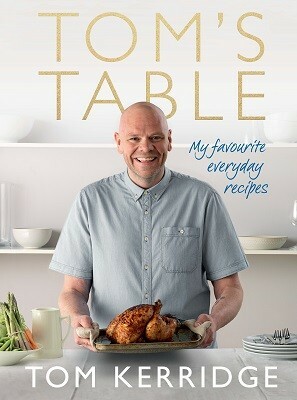 Tom's Table features 100 delicious everyday recipes so that anyone can achieve his Michelin-starred cooking at home. This is the sort of food you'll cook again and again, whether you bring his hearty and delicious starter, side, main and dessert recipes to quick mid-week meals or weekend dinners. The recipes include Cheddar and ale soup, Simple sunflower-seed-crusted trout, the ultimate Roast chicken, Lamb ribs with roasted onions, Stuffed green peppers, Home-made ketchups, Popcorn bars, Date and banana milkshake, Pecan tart, and many more. With every recipe photographed by Cristian Barnett, this book is full of inspiring yet simple ideas from the man of the moment.